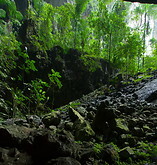 The Deer cave in the Mulu national park derives its name from the deer which used to come to the cave to lick its salt. The cave is huge - at 600m x 415m and 80m high it's the world's largest cave chamber and could contain 47 jumbo jets. The cave hosts a large colony of bats who fly out of the cave at sunset.